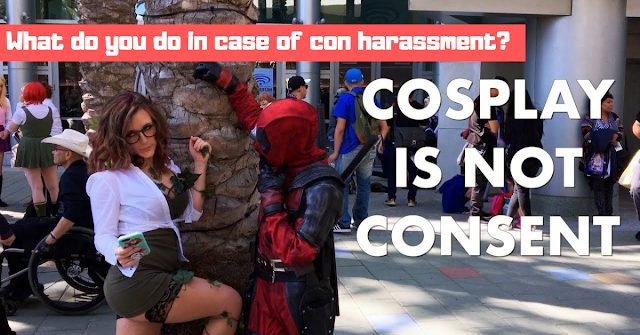 Home > Cosplay > Otakucosplay Opinion > MUST READ: What to Do If You Felt Harassed During Conventions? Cosplay and Anime conventions are so common nowadays and with that comes various problems. One of the most common problems we encounter is harassment. What should you do in case you experience something that you felt is a form of harassment? Here are some advice. Remember that "COSPLAY IS NOT CONSENT." If you are cosplaying it does not give anyone the right to harass you. In fact, you can even say no to someone who would like to take a photo of you. Remember, even if you are cosplaying you are still entitled to your own rights as a person. Be always aware that you are going to the convention as an attendee and not as a convention or public property. This would change however if you are a guest at the particular event, even so, there are still limitations. What to do in case of harassment? Say No and Speak Up. Inform the person concerned immediately that you do not feel comfortable with what he/she is doing. Ask him/her nicely to refrain from the action or otherwise, you will report the person. Report the Person. If the action is of much concern, report it immediately to the organizer of the event. You can approach any staff or the information area. Be sure to narrate what happened and what is your concern. You can also approach security personnel. Stay Away. Stay away from the person that is harassing you. Be With Friends. Whenever attending events it is also important to be with someone you know. If you are alone, then stay with someone you know or just leave the event to secure yourself. What if you do not have the courage to do it right at that point and you feel powerless, what can you do? Instead of posting it immediately to Facebook as a shame or rant post what you can do it message the organizer of the event directly either through their Facebook page, website or any available contact point. This way you can be assured that proper action will be taken. NO, WE ARE NOT! This post serves as a reminder to all event attendees on what to do so that proper action can be done immediately. Remember that the longer it takes to be reported the harder justice can be served. Let us not allow people to harass us and let us help protect other people from them. You can still post your bad experience on Facebook but before that be sure to have reported it already to authorities. Since we have a law called the Cybercrime Prevention Act of 2012, we can be made liable even if we are on the right side of the law. Remember that prevention is better than cure! Have fun at cosplay events and be aware. Don't forget to share this. Do you have other suggestions on how to deal with harassment or have you experienced one? Share it with us.